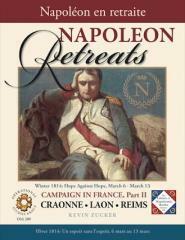 Operational Studies Group’s next game covers the Campaign in France, Part II: 6 March to 13 March 1814. The major battle was Laon, on 9-10 March, when Napoleon, with 37,000, went up against Blücher's position, on the hill of Laon, with 85,000. (Marshal Marmont with a separate VI Corps was supposed to support the attack, but he was dispersed in a night combat.) Blücher wasn't feeling well and failed to pursue. One more battle was to follow (after two days for R&R) and Napoleon won that battle: Reims, against St. Priest. So actually, he won two out of three.